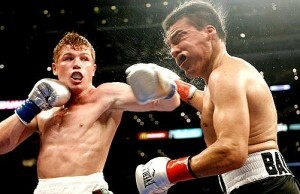 Julio Cesar Chavez Jr. TKO 7 Andy Lee: Boxing is Saved! June 16, 2012. El Paso, Texas. Julio Cesar Chavez Jr. showed the world that he is a true champion Saturday night when he battered Irishman Andy Lee, a former Olympian with no major victories over elite-level fighters and not ranked within the top ten in either The Boxing Tribune or The Ring Magazine’s rankings, en route to an impressive 7th round TKO victory. “I showed the world tonight that I’m the best middleweight out there. I took [Lee’s] best shots and he couldn’t hurt me.” Chavez Jr. told a glassy eyed Larry Merchant. Andy Lee (28-2-0, 20 KOs) found it difficult to keep Junior at bay within the conspicuously small 17 1/2 ft ring, frequently finding himself being pressed against the ropes and worked over to the body and head as the tough 160 lb. champion shrugged off the challenger’s punches. “I just couldn’t hurt him,” said the bloodied Lee after the fight, “I was throwing, but he walked through them. 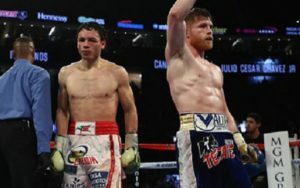 Even when I backed straight up and placed my back against the ropes… he just kept coming.” Julio Cesar Chavez Jr. proved he had a tough chin for a 159 lb fighter as he plowed forward, eating straight left hands and uppercuts before getting within range and pushing the taller Lee into the corners. Chavez Jr. had been criticized by some in the media for his weight during previous fights, sometimes entering the ring as heavy as 180 lbs–a cruiserweight. Many within the boxing writer fraternity had questioned whether or not the champion should continue to campaign at middleweight, especially considering past difficulty in making weight and his positive drug test for Furosemide, a banned diuretic. “This time the weight is not a problem. I made weight easily and I feel strong and healthy,” Junior said in his dressing room as he declined the mandatory pre-fight, anti-drug, urinalysis test, “my boxing has improved and I won’t have to rely on being the bigger man as some people have said.” And pre-fight, he looked good, and healthy, not at all weight-drained and very comfortable as he was ushered past the unofficial scales set up by the HBO team without weighing in. “I’m ready for [lineal champion] Martinez, I’m going to shut his big mouth,” said Chavez Jr. through an interpreter after the fight. HBO commentators hungrily agreed. Andy Lee was supposed to be a stern test for the undefeated middleweight champion, but was instead bullied and battered from pillar to post by the skilled Mexican who now improves to 46-0-1. The sport of boxing definitely needed a night like Saturday’s, especially after the Pacquiao vs Bradley debacle in Las Vegas last week. Saturday’s action went off without a hitch, a testament to how well things can go when everyone is on the same page. “I love Texas!” exclaimed Hall of Fame promoter Bob Arum sporting a ten-gallon hat emblazoned with solid gold, diamond encrusted conchos on the band, “I’d hold every fight here if I could. The Texas commission and the WBC work perfectly together and that makes it all easier for me.” The statement was punctuated by WBC President Jose Sulaiman firing a six-shooter into the air before holding the key to El Paso, which was presented to him earlier in the week, against his crotch as if it were a golden phallus and thrusting it at the seated press corps. Nearly everyone on press row writhed in ecstasy as the champ’s arm was raised in victory. “All hail the new champion! We were wrong [about Julio Cesar Chavez Jr.] and take back everything we said, he is a great and unstoppable champion and has proved it now after defeating an unheralded contender!” the entire BWAA said in unison reading from the supplied press releases placed on each seat. Bob Arum was smiling ear to ear as he soaked in the good vibes. 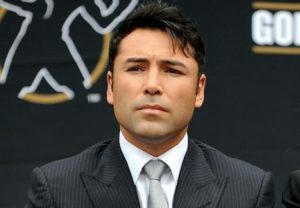 The room fell silent as everyone turned to face the hated “writer.” Even the Top Rank buffet table had a moment of awkward silence as the impartial boxing media halted their grazing and let un-chewed food fall from their open mouths at the audacity of the question. As Arum tossed bags of free fight merchandise into the crowd, the media swarmed amongst themselves like a feeding frenzy and just about everyone was happy. Even the Sun Bowl security guards were smiling as they forcibly removed the upstart Mayweather-nuthugger Paul Magno. Why can’t all boxing nights be like this? 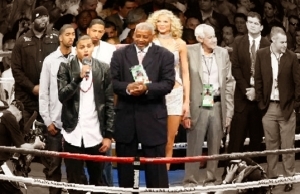 Charlie R. Horgan lives in Los Angeles and has been a regular contributor to The Boxing Tribune throughout its storied history. 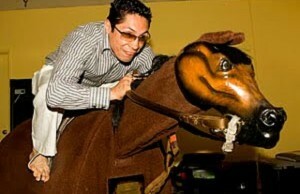 You can follow his off-color snarky remarks, lewd jokes and live boxing tweets on Twitter @OGYokYok.